Kiki Smith, “The Island of Negative Utopia.” Stenciled and screenprinted poster on paper, 1984. 17 1/2″ x 22 1/2″. 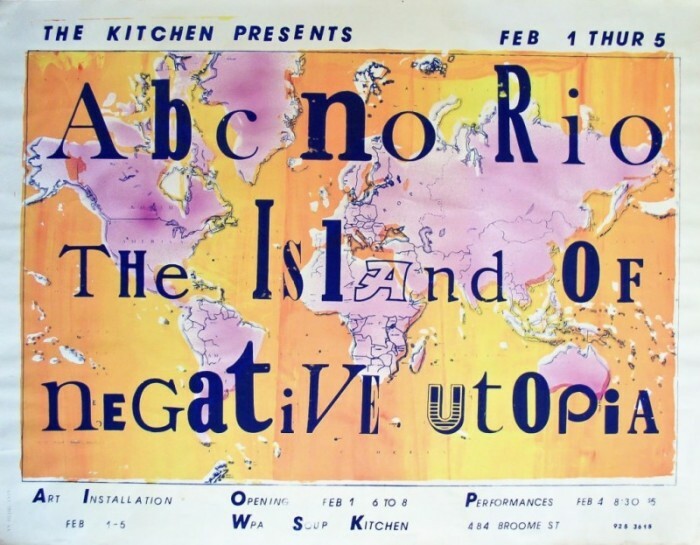 Original poster for the Isle of Negative Utopia show at the Kitchen. The creative spirit of the Lower East Side in the 1980s is encapsulated in the phrase “The Island of Negative Utopia,” the title of an exhibition about ABC No Rio (a still operating LES art space) held at the Kitchen in Soho in 1984. Gallery 98 has lent the silkscreen poster that Kiki Smith made for the show to the exhibition “The Downtown Decade: NYC 1975-1985,” up through October 10th at Glenn Horowitz RARE, 17 W. 54th Street, NYC. It was artist Joseph Nechvatal who named the Kitchen exhibition, taking his inspiration from the year 1984 and George Orwell’s dystopian novel of the same name. 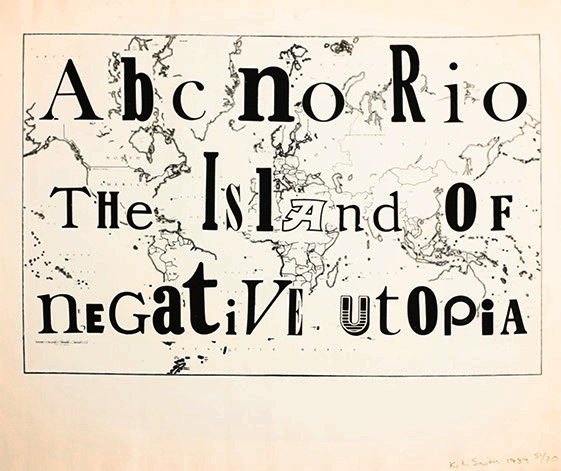 From the beginning, though, the phrase “Island of Negative Utopia” had an alternative meaning more directly linked to ABC No Rio and the art renaissance that was emerging out of the rubble and decay of downtown New York. Amidst the squalor, artists found cheap rent, camaraderie and creative purpose. Those were glory days for ABC No Rio, where every exhibition was animated by political purpose and rich in humanity. Kiki Smith’s “ABC No Rio: The Island of Negative Utopia” poster is a key work from her early formative years, when she was actively involved at ABC No Rio. The poster’s collaged typography overlaying a world map is a marvel of graphic design. Each of the silkscreened posters has its own rich color scheme. The following year, Smith would do a variation of her poster to help raise money for the printing of the book ABC No Rio Dinero: The Story of a Lower East Side Art Gallery, edited by Alan W. Moore and Marc H. Miller. Printed on cloth without the exhibition information, this 1985 silkscreened variation was done as an edition of 70. Kiki Smith, “The Island of Negative Utopia,” 1985. Signed and numbered.